We can turn on the cable news channels. We can scan the internet. We can read the papers, listen to the radio, and scroll through the barrage of tweets, posts and snaps. In this age of information overload, the messages before us exceed the time we have available. With that in mind, another option beckons: Walking outside, starting an outdoor project, and letting the world come to us. 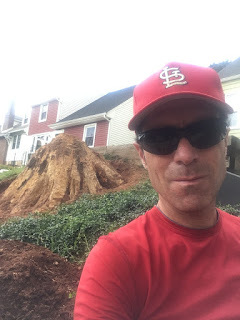 For the past few weeks, I’ve spent a number of days standing on the hill in front of my home, trying to take down a tree stump that’s been in place since we had our giant oak tree removed four years ago. The stump was four feet tall from the front, and at least three feet in diameter (I forgot to measure before I started hacking away at it). I have pretty bad allergies, so a chain saw was not in the cards for me. And as a teacher who isn’t working this summer, I didn’t want to spend more money hiring someone to do the work. So I gave it a shot, and used all kinds of tools – an ax, a hatchet, a sledgehammer and wedge, two handsaws, a shovel. Call me what you wish – stubborn, naïve, a glutton for punishment. Guilty as charged on all accounts. But I can tell you that in my days chipping away at this stump, I learned some cool things about the world, from a different angle. As laborers passed by during the day, some wanted to chat. There was the Verizon man who stopped his truck in the middle of the road and told me I’d be there for 30 years. There was the man walking home from work who shook his head, looked over his shoulder and said, “Three years, man.” The trash collector, public-works truck driver, and landscaper all had advice as well, and the landscaper handed me his business card. The mailman would tilt his head, study the stump and give me some feedback each day – “It looks a little different today,” he’d say, or “I think you should carve the presidents into that.” He said if it were his to do, he’d have tied a chain to the tree and the bumper of his car, started the car, then watched the bumper fall off and onto the street. My most insightful conversation was with Pierre, a neighbor I’d never met who was born in France in the 1930s and also lived in Italy before moving to America. He told me about harvesting sugar beets in the south of France so that he and his dad could afford a new wood-burning stove. He said that in Italy after World War II, cutting down wood for your stove took a unique twist. Explosives were easy to come by, Pierre said, so his dad would blow up a tree and bring the wood home. I told him about the World War II novel I was reading, All the Light We Cannot See, and we talked about how difficult life was during that time. Some passersby just gave me encouragement as they walked with friends, family, or on their own for exercise. After a number of days, drivers started honking their horns or calling out from their cars. The next-door neighbor who had first discouraged me had become a full-fledged color commentator, chiming in about the difference he saw each day while telling me I have a job waiting for me when he finally starts the landscaping business he hopes to get off the ground. And it wasn’t just people I encountered: The plethora of organisms I saw in the tree and soil, and the mulch I created and used, told me volumes about the environment. The shadows and sun angles helped me tell time without a watch or phone nearby. The glass bottle pieces, blue button and old-school aluminum can tab I dug up from the soil offered a glimpse of consumer product evolution. And the iPod I hooked up to a speaker taught me that outdoor work is best suited to the music of Prince and Queen. After more than 20 lawn and leaf bags had been filled, and more than 50 hours had been spent on the tree, I still had the solid core of this stump left. Pierre hopped up on the hill and tried to help me some more, but he could see how hard this wood still was. I dug down below the roots, called the company that had cut down our tree to begin with, and got a reasonable estimate for sawing off the rest of the stump. When the mailman passed by, he said, “I’m just remembering, I was 18 when you started this.” We laughed, and that sealed the deal. Time to stop. I’ve got other things to do in the second half of summer. The tree man will arrive next week with a chain saw in hand. But after two years of nonstop educational leadership college courses and a very busy year of teaching and newspaper advising, I sorely needed some time away from the laptop this past month. Manual outdoor labor was a good release, and I enjoyed my transcendental July. And while I was outside, I took in more than just the sun and the chirping of birds. I listened to people as they gave me advice, told jokes, and shared stories. It felt a little bit like that oldest form of media – word of mouth. I didn’t learn more about health care or immigration or foreign policy outside this summer. But I connected with others, and learned from them. When I had finished digging yesterday, I took a couple of photos – perhaps the first “stump selfie” in history – and put away the tools. I felt good about stopping, but also felt a pang, as though I might miss this a bit. But no worries – once the stump is gone, there’s dirt to fill in, and ground cover to plant. I’ll be back out there again. And I’ll be ready to talk and listen. Warren. Nothing like getting outside with an axe and shovel. Mission accomplished. Now you can go inside and watch "Shane".